For Andis and Oster dog clippers you are free to choose from any of the snap-on blades with universal fittings. For Wahl and Moser machines we tend to recommend Wahl blades as we have found problems with universal snap-on fittings as the clippers get older. If you’re in any doubt then please get in touch – we’ll be more than happy to point you in the right direction. A quick word on clipper blade lubrication – if you don’t lubricate your blades well and often (we seriously recommend a few drops at every blade change) your clipper will start to over work and possibly run more slowly. Professional dog clipper blades are precisely made and if there’s dirt between the faces they get hot more quickly and don’t run well. So if you’re buying blades make sure you have enough blade wash and lubricating oil – otherwise you’ll be buying blades more often than you need to! A last word on extra wide blades – these have become incredibly popular with expert, busy groomers as they save a lot of time when clipping and will still produce outstanding results. Again they’re a universal fitting and will work ion most professional clippers but if wide blades are for you we would certainly recommend that you invest in a top of the range clipper. If you have any dog clipper, accessory or cleaning and lubrication questions then please get in touch. We’ve been selling and servicing dog clippers for over 50 years and so we’ve built up a fair bit of knowledge along the way. Guaranteed to improve your clippers’ performance, ProEdge-X blades offer faster, smoother clipping, with 25% more cutting edges than other rival brands. Made from high-grade carbon steel, ice tempered and chrome plated to deliver optimal strength and durability. 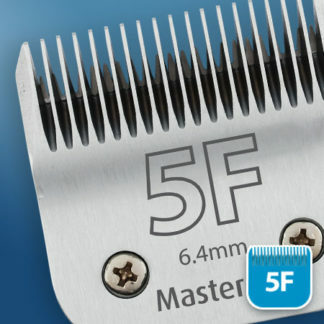 Available in a range of popular sizes, fully compatible with all Oster & Andis professional clippers. Part of our best selling range of detachable clipper blades for dogs. Universally compatible with Oster and Andis professional dog clippers. *compared to rival standard blades. *compared to regular width clipper blades.